Picked to finish just behind Dayton in the Atlantic 10, the Rhode Island Rams entered the 2016-17 season looking to do big things. With star guard E.C. Matthews back from a torn ACL, the Rams were finally back at full strength. That is, they were back at full strength until Hassan Martin went down. Martin, who missed the final four games of last season with a knee injury, is out again indefinitely. The injury to Martin in Rhode Island’s loss to Providence threw a wrench in the Ram’s efforts to put together a stellar non-conference resume. 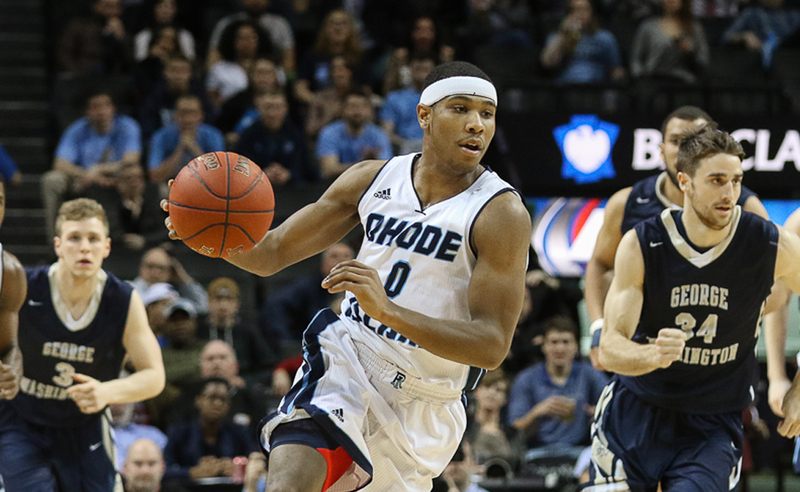 Despite the injury issues, Rhode Island continues to fight and show flashes of dominance. Although the Rams did not have the success they hoped for in the non-conference, they very well could still win the Atlantic 10. Whenever Martin does return, Rhode Island’s quest for an A-10 title will gain a significant boost. Back on November 19th, Rhode Island picked up by far the A-10’s most impressive win of the season. The Rams defeated nationally ranked Cincinnati to improve to 4-0 on the young season. In the following game, Rhode Island nearly pulled off a huge upset, but came up short against Duke. While the Ram’s victory over Cincinnati will certainly show up big in March, one can only hope, however, that it will be enough to put URI in the NCAA tournament. Although Rhode Island did not manage to grab any other standout victories in non-conference play, the Rams did pick up some solid wins. URI defeated teams like Old Dominion and William & Mary over the first half of the season. These victories might not sound incredibly impressive, but they are by far the best Rhode Island picked up outside of the Cincinnati game. The good news is that the Rams huge win against the Bearcats will look good in March; the bad news is that they did not come up with any victories to compliment it. Despite only grabbing one good non-conference win, Rhode Island remains in solid position to make the tournament come March. Suffering a total of four losses over the course of non-conference play, Rhode Island definitely dropped more contests than it hoped to coming into the season. A 10 point loss to Duke started a stretch where the Rams lost four of six games. Playing on the road, URI fell to Valparaiso and Providence in back to back contests. Rhode Island lost both of these games by just three points, causing plenty of frustration. Just a week later, the Rams were back on the road taking on Houston. Despite a hard fight, the Cougars defeated Rhode Island 82-77. Ultimately, the Rams did not suffer a true bad loss in the non-conference. While Rhode Island certainly thought it could, and probably should have, won some of the games it lost, the Rams avoided any disastrous losses. If Rhode Island wants to make the NCAA tournament, the Rams must eliminate any potential bad losses. URI can ill afford any slip ups to the A-10 bottom feeders and needs to distinctly separate itself from the middle of the pack. In the end, Rhode Island slightly underperformed in non-conference play. Nationally ranked to start the year, the Rams were expected to win three of the fours games they lost. Thankfully, the win over Cincinnati saved URI from an awful non-conference showing. As A-10 fans lets hope a strong conference showing is enough to put the Rams in the Big Dance. The sooner Hassan Martin returns the better. Whenever he does eventually get back, the 6’7” big man will provide a huge boost for the currently 8-4 Rams. With a healthy roster, Rhode Island can easily make some noise in the A-10 and compete for a conference title.